Has anyone ever been to this? I know it’s last years flyer but couldn’t find this years but it’s about the same. It’s going to be this coming weekend on the 22nd. Thinking about going. I haven’t gone, but I’ve heard it’s good. I can’t go next weekend but maybe next year. 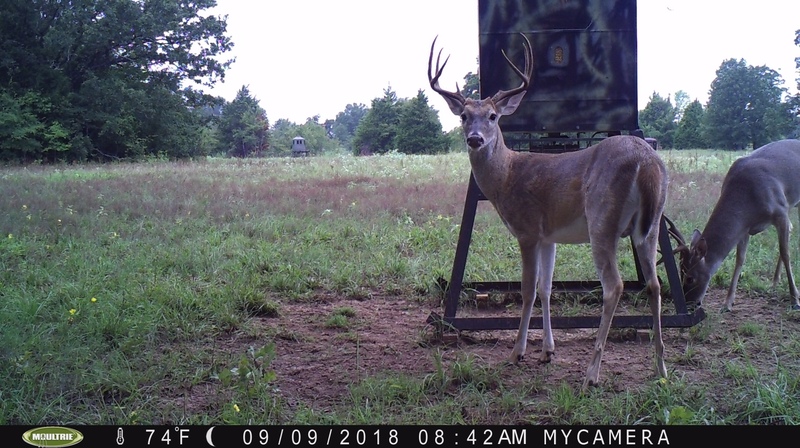 Have an old buck I’ve been chasing for 6 years now in a pasture that made it through last season and is back but he is starting to decline now. Would be a good first buck for one of my kids. 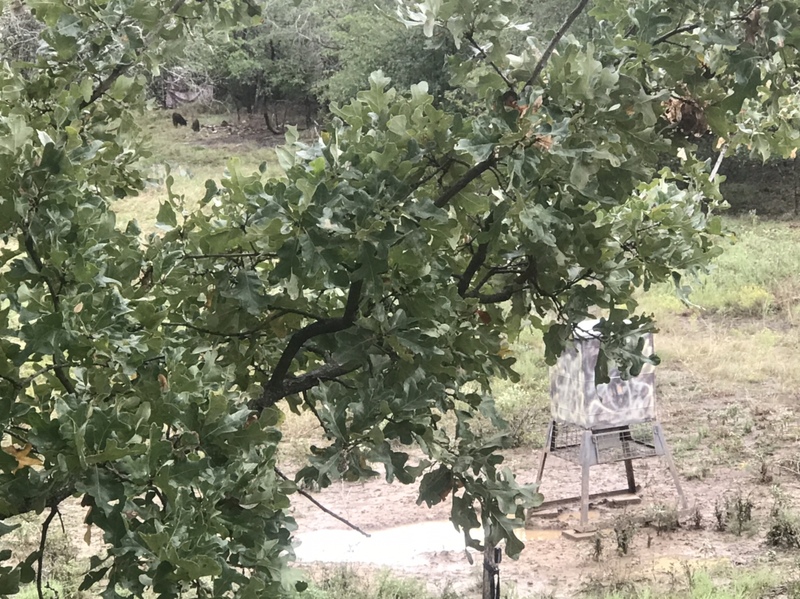 Had quite a few deer hitting the feeder and everything is green again as we have gotten rain, had a storm come through yesterday evening but didn’t drop a lot but enough to water the grass. I would like to go next weekend if someone can let me know if it’s only Freestone county residents? I live on the line but all property is technically Limestone county. I think this is awesome and would pay the money but I technically don’t own land in the county. I think it’s probably open to anyone, they are trying to raise money. Thats a good looking buck! 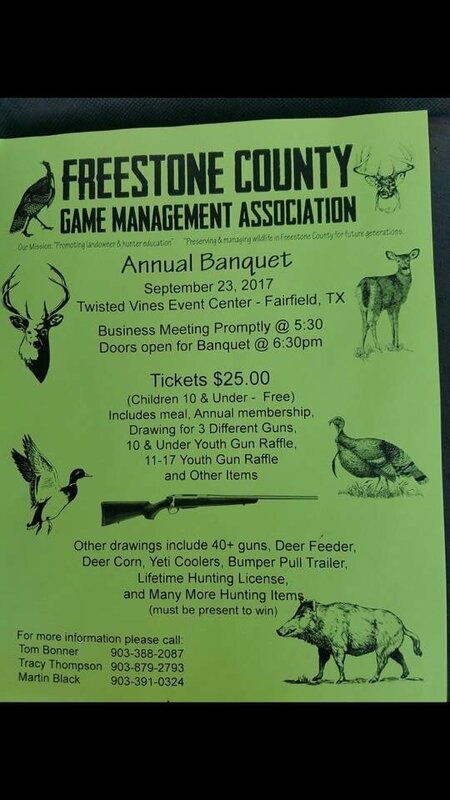 And I had never heard about the Freestone County Game Management Association but I will have to check them out. The banquet is good...lots of guns and things raffled. Anyone can go.If you hunt in freestone county, sign up for the big buck contest. It's named after my old man! Man I would like to go to this banquet but can't swing it. I'm thinking about heading to my family place in Teague next month. Haven't been in years, but have the itch to relive some childhood memories and maybe take my first Freestone deer off the place. Is Sam's buffet in Fairfield still open? Wouldn't mind getting a meetup going. Sams is still open, my sons favorite place! Yes, Sam's is still open. Mexican food restaurant on 84 in Teague is the best place to eat. Food is good, beer is cold, and margaritas are pretty dang good. Anyone know what happened to the flyer that was posted on this thread for the freestone county wildlife event that is happening tonight ? Here now and it’s packed!!! I has intentions of going but got busy wiring some lights on my skinning rack and time got away from me. Couldn’t make it hunting this weekend but is it dead in Fairfield? No kills? Getting picks and seeing new bucks each week. 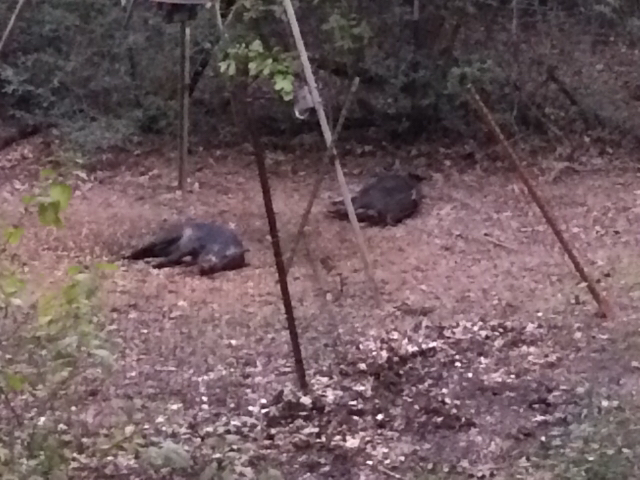 Shot a couple pigs yesterday and had a slick 6 come in after that I’d never seen, nothing fantastic but would make a great buck for one of the kiddos. Bucks are definitely on their feat here at our place. Our property is on Limestone/ Freestone line. Been battling army worms and only seen sporadic deer due to all the acorns on ground. Stepson shot a beaver with his Mathews bow. Let the jokes begin! Trying to load photo for proof! Last edited by Tejas Wildlife; 09-30-2018 at 11:11 AM. I hunt on the freestone/limestone county line (north of the lake). Very few deer sightings and only a few on cams. Pigs are plentiful but not the ideal target species. My wife did get a shot on a doe yesterday morning but the blood trail ended and resulted in a non-recovery. This is my 2nd year on the property and we haven't quite pinpointed the rut time-frame. Any idea when that usually kicks off? but the bucks have been way more active at our place, they have already split up and like i mentioned above i saw a mature buck chasing a doe wknd before last. I would be in the woods this wknd, this cool air will have them moving around. I’m heading up to the farm after my sons football game today, took Monday off for a long wknd. Think the hunting will be good. I'll be hunting with you Freestone county folks the week after next. I was drawn for the archery hunt over at Richland Creek WMA. I am READY! 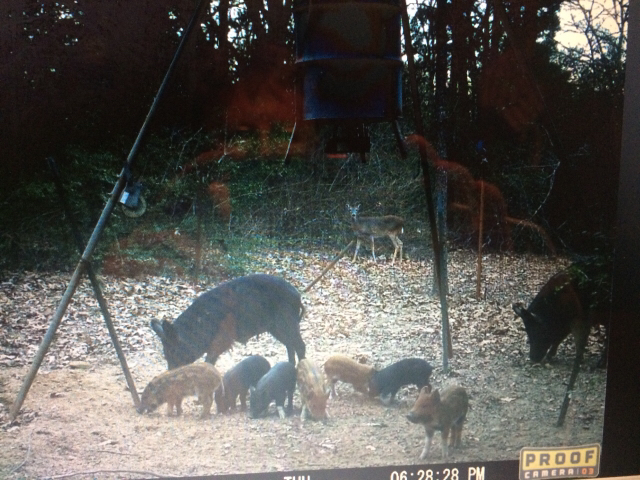 Freestone is loaded with pigs. We are covered up with them. 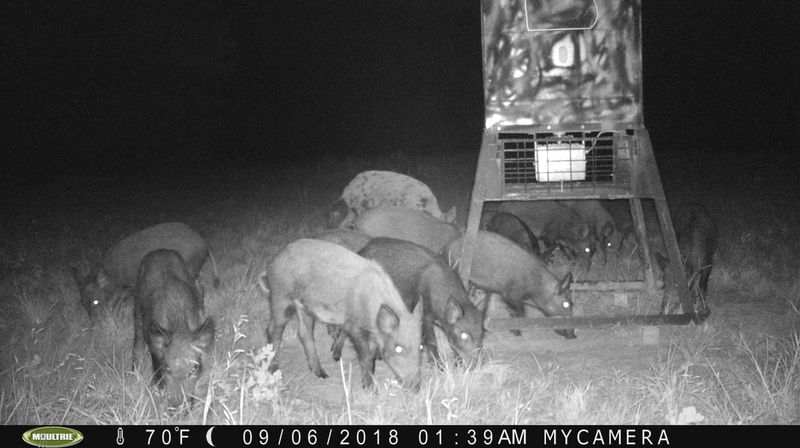 We have trapped almost 40 hogs since the beginning of September. Bucks have showed up, hope to get out this coming weekend. Is there anyone that y’all know that does pasture mowing in the Fairfield area? I need to find someone available to keep 2-3 acres by the house and around the feeders and trails mowed during the year as needed. My rancher on our lease might do it. I can call him. I can get you a name and number next week. A friend has a place in Dew and we had a guy mow a few acres around his house last week. Thanks Ken I would really appreciate it! Well any reports or good rut activity? I hunted this wknd, fewer bucks on camera, they are transitioning away from the feeders. I havent been in a tree around here in a while (too much going on), but have had several different deer show up on camera in the back yard recently. LOTS of green stuff for them to eat on, but they should still swing by and pick up a golden crack nugget every now and then. Weather should be great the rest of the week. I am going to go this weekend. It should be close to the time where bucks are getting more active towards the doe. Wednesday after the rain and Thursday should be really good, wish I could get up there, will be sitting with the boy this wknd for the early youth wknd. Next time for me to be in a tree will be regular season opener unless my boy shoots one early this wknd. I’m seeing a lot more deer on camera and on stand the past few days. Looks like batchelor groups have split up. Also, some of what I’d describe as doe “following” but not yet “chasing”. Krio blind is a little toasty! Yes I’m dying in the stand right now. No wind at all. I have had a lot of deer and hog movement today. Shot a hog this morning with my crossbow from my dad’s stand. Then hunting my stand this evening and had 2 doe come in for a few minutes till the hogs ran them off. 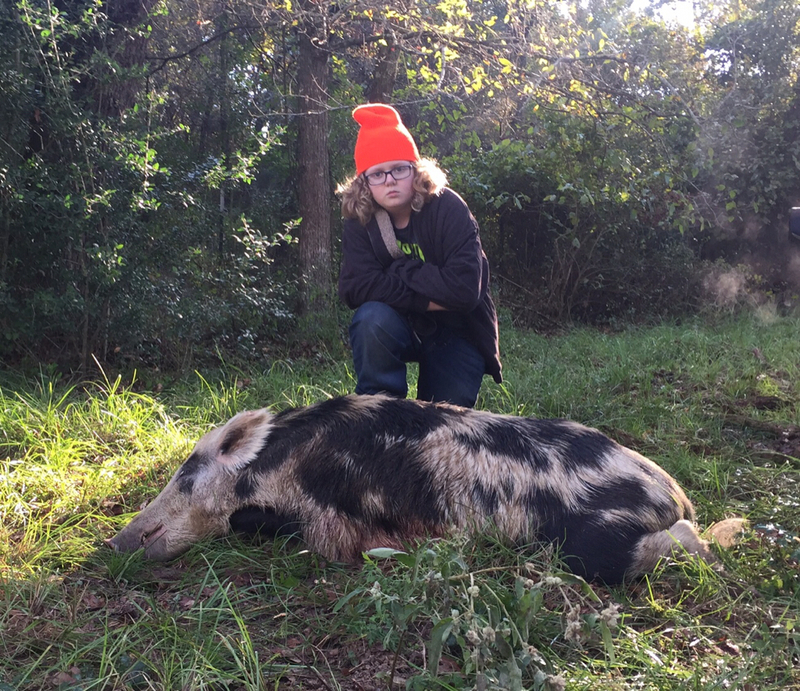 Got one hog dropped on the spot with my AR15-.223 then 10 minutes later the next one came in pretty much ignoring the first one dead on the ground. Also killed with the .223. Both were with the Photon night vision scope, man this thing is great for low light to no light hunting! 3 for 3 today. Also saw my first Timber Rattler ever in over 20 years of hunting here in Fairfield! 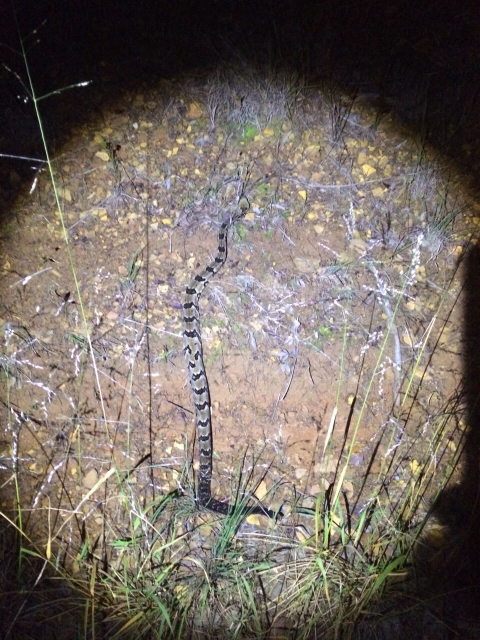 He was crossing the county road after dark as I was headed into town. I stopped long enough to take this pic of it! It has been an awesome day for me! For the record we are going to eat all of the hogs! Howdee guys. I hunt right near Lake Fairfield and also off Hwy 489. Ive been in hog heaven it seems. Very few pics of deer and haven't even seen a shooter buck on camera. 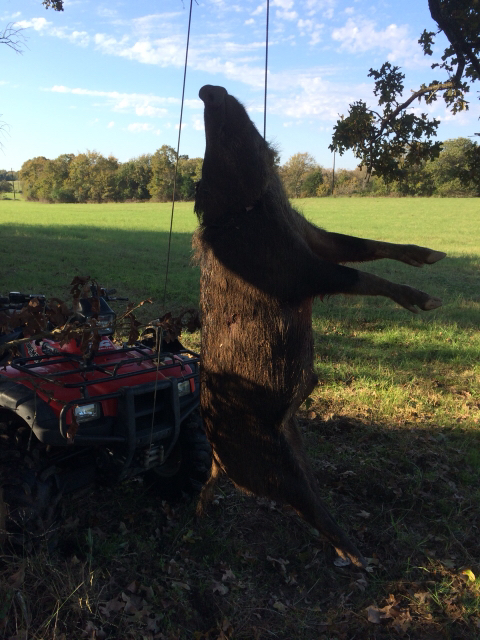 I shot up some hogs on last trip. Havent been in 2 weeks. I get off this rig Tuesda and will bow hunt last couple days of the season and be there for gun opener. Good luck to all. Plenty of pork to go around!